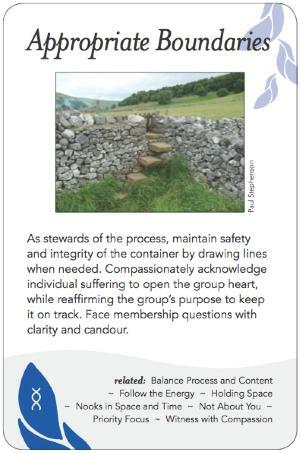 As stewards of the process, maintain safety and integrity of the container by drawing lines when needed. Compassionately acknowledge individual suffering to open the group heart, while reaffirming the group's purpose to keep it on track. Face membership questions with clarity and candour. The health and effectiveness of a group will be partially determined by its ability to develop and maintain appropriate boundaries, and to hold or adapt those boundaries as required. In the absence of clarity on what the boundaries are, they will typically get tested or pushed on repeatedly, until the group either dissolves or sets a healthy boundary (or, sometimes if sufficient new members are available, a group will have high turnover as old fed-up people leave and new ones come in while maintaining the same organizational pattern). There are few things that bother a group more than having one person's drama take over a meeting. . . . Boundaries also arise in questions about group membership, both initially and later on. Once a group has formed, it has a unique identity that is felt by all members. When a new person joins the group, the group boundaries must be reopened to allow the new person to become part of the group. If this is not done, the newcomer may feel like an outsider, and the group may feel irritated by the presence of a "stranger". The group should be honest with itself about whether it is open to new members in general, and to any particular new participants. Membership boundary issues can also arise when splitting into subgroups. Sometimes people or topics that are critical for the group to move forward make us uncomfortable, so watch out for the abuse of boundary-setting to exclude import elements. Individuals are defined by their physical, emotional, energetic and psychological edges. A group is defined both by a common goal and by the collective limits of its members. Stewards of the process maintain a balance between affirming limits, safety and focus for the group, and facilitating the softening of these limits to encourage new ideas and reorganization of structures. When individuals in a group have appropriate boundaries, their behaviour is self-moderating and they are clear on their role. They can selectively soften their boundaries to increase the potential for new ideas and creative solutions. If individual boundaries are too open or personal space is violated, confusion or wounding may occur that will hinder the group's ability to function effectively. If a group has no boundaries it may have difficulty staying on track, and achieving a collective result. When one individual dominates air time in a group, others may become resentful or silent. If the facilitator can find a way to help a dominant member self-moderate, then that individual has learned something and the group benefits from the demonstration of respect, which can foster a more open atmosphere. The charge from an individual trouble can affect the fabric of the group as a whole. An individual trouble may be a microcosmic symptom of a larger issue the group faces. In either case, a public resolution can lead to healing. Often a specific individual trouble is an example within a context of similar (or identical) issues within an organization. By shining light on and working to resolve one instance of this type of trouble, a catalyzing example is set that can help shift the other troubles of this sort. Public resolution of personal trouble can be initiated either by the people directly involved in the trouble, by other members of the organization who are impacted, or by the facilitator(s). In an organization with a strong community aspect, this may be an offering of or asking for assistance in a non-conflict situation. In these cases, the public resolution may help shift similar instances within the organization (as with the other variations), or may provide an opportunity to validate & strengthen the community, through caring and support. Spiral Dynamics talks about the "mean green meme", when green's inclusive energy is over-used in a way that dissolves useful boundaries. Thoughtful article on ground rules for social justice conversations aimed at creating a "brave space": From Space Spaces to Brave Spaces: A New Way to Frame Dialogue Around Diversity and Social Justice, by Brian Arao and Kristi Clemens.